We've started packing already, and it's making the kitties antsy. I think Greta remembers the last move, and how there was another totally annoying kitty at the new place. We're not doing that to her this time, but she's making sure that she's more than enough cattiness for one family. This weekend we paint because some of the rooms are really awful (who would think that toothpaste green is a good colour for a dining room? I suppose you would never forget to brush your teeth after meals) The basement is pine-yellow wood panelling, and since it will be my studio, I'm hoping for a prettier colour. Also, the garden needs a lot of work. The whole lawn needs raking, and the grass is in rather poor shape in spots. This year I'm only planning to put in a veggie garden, but I still have to dig up bunches of sod from clay soil. The rhubarb needs to be moved, but the asparagus and peonies will have to stay where they are until autumn. I have zucchini and squash seedlings I started, plus some pansies and asters for colour. I'm hoping to find some tomato and herb seedlings somewhere! My mint survived the winter beautifully, so I have a large pot of chocolate-mint to pick from all summer (it makes delicious tea). Anyway, for something more entertaining, here is Lev doing his werewolf impression (volume needs be be up a bit to hear him). I think I might have a problem with over-committing myself. I had planned to take it easy this summer, slowly working on a couple of projects, and spending lots of time with Baby Mitten. 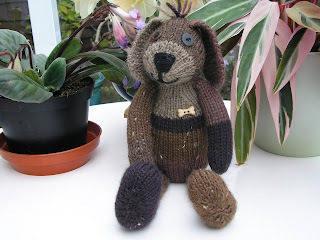 Now I have some great ideas for a clothing bundle for the big bunny and teddy, an interesting sketch for a new toy, all the work involved in revising the Fuzzy Knits book (which includes knitting all the toys in it), and a secret project I've been wanting to work on for over a year. At least one of those is going to be cut, I know, because I just don't have that much time! Or maybe I need to rework my ideas so all the projects are a little more manageable. Are any of you work-from-home moms? Do you have any advice for how to balance work and time with baby? This is just a random picture to make the post more interesting. Well, in other news, the Ravelry swap is going well! I got my swap partner the other day, so picked out some pretty yarns in her favourite colours and matched them to some of my favourite clothing patterns (ravelry links). I have one item done already, and I think it turned out just gorgeous! (I'll try taking photos later today so you can see) Next up is a pocket sweater in hot pink! Oh, and if you're stopping by from Fiber Arts Friday, check out this interesting post from earlier in the week. I found Mr Mitten with some time on his hands yesterday, so I bugged him to finally get the Mama and Baby Bunny pattern done. You can find it on Etsy or Lulu. I'll be adding it to Ravelry soon, but I just noticed a tiny mistake that I want to fix before putting it in my Ravelry shop (nothing major, it just says the baby bunny is 14" tall, not 7"). Thanks for all the great ideas for the big toys clothing bundle! I know what I want to do now, the challenge is to find time. It certainly won't happen before we move, but if I get my act together, I might be able to get it done before summer holidays. Which would be perfect, since my ideas are very summery! Between vaccinations last week, the beginning of teething, and rearranging our schedule in preparation for Mr Mitten going back to work, I've been a wee bit tired this past week. I didn't feel much like whining, and I haven't done much work anyway, so there wasn't a whole lot to blog about. Anyway, thanks so much for your lovely comments on the video and photos! It's fun sharing a bit of our lives with you, especially since we don't have many friends with kids with whom to commiserate. One thing I did manage to get done, after about 2 weeks of squeezing in an hour of knitting here and there, was this big bunny. I wasn't quite sure I liked her when she was done, but she zipped out of my shop so fast, I was clearly mistaken about her cuteness! I know some of you will ask about her dress, so I'll tell you what I can. I've had some thoughts about putting together a bundle of clothes for the bigger toys, so this was a trial at one dress design. It was a bit too complicated, though. The final version will have a simpler skirt, but should be just as cute. The bundle I'm planning will have 3 designs: a dress, a cardigan, and something else. Anyone care to leave a comment about what they'd like? There's no set date for when I'll get it ready, considering how much we have going on the next few weeks. Life has been busy here lately, hence the lack of blog posting. It's going to continue that way for the next month, until we're finished moving and all settled in. Everyone has probably been busy with the holiday, spring breaks, and the change of season, so I don't expect you've missed me too much! Anyway, since I haven't much to write about today, I'm just going to share some photos of fuzzy pups. This first one is from Sara (aka sarloz) who has knit plenty of my toys, and is super helpful in my Fuzzy Mitten group on Ravelry. She's organizing the swap over there. If you've been thinking of joining, there's still a few days to sign up! 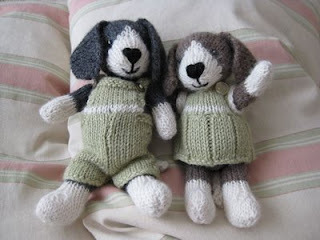 The second photo is the pup that Pat knit from the Scraps Chaps kit she won. She's named him Murphy, and he's a very friendly looking fellow. This last photo was sent to me ages ago by Rebecca, and I kept meaning to share it, but never found time. These pups were an engagement gift, and if you look closely, you'll see a tiny gold ring on the girl. So sweet! 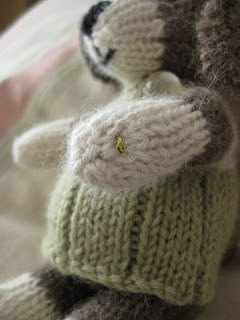 If you're on Ravelry, and part of my Fuzzy Mitten group, please consider joining the swap for May! We're a bit short of people at the moment! The swap is for 3 clothing items, to fit a regular size Fuzzy Mitten toy, plus a treat or two for your swap partner (think a bar of chocolate, packet of nice tea, pretty stitch markers, etc). There's still about a week left to sign up! I've worked so hard the last 2 days trying to get these kits ready! I wish the yarn had come sooner, so I could have taken a little more time with them, but am I ever glad I bought a ball winder! Otherwise, I would have taken a week to make them all, instead of 2 days. I've had to raise the price by $1, since most of the yarn in these kits is new, rather than mostly left-overs, as in the previous ones. I'm off to list them now, and hopefully Lev will stay asleep until I can get them all done!